Ford's 100 years in photos 6/52 | What Car? 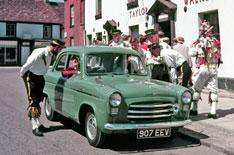 This week, an Anglia 100E is surrounded by Morris dancers in a 'quintessential English village setting' to emphasise the successful integration of the brand into British life. The styling of the Anglia was typical of the post-war shift in design from practical to something more stylish and fun. Ford says the change saw the sit-up-and-beg styling of models such as the Prefect and Pilot replaced with the glamour of the Consul and Zephyr. Motorists wanted more from the cars after the tough years of the war. The Anglia was introduced in 1953 and cost from 360. More than 335,000 of the cars were built at Ford's Dagenham plant in Essex, which now builds diesel engines. Click here to see last week's picture of a suit that helps designers feel older than they are.